In 2010, 41 percent of all tax returns filed had no income tax liability. This represents over 58 million income tax filers. Nonpayers have grown substantially over the last two decades. In 1990, only about 21 percent of returns had no tax liability, about half of what it is today. The expansion of tax credits is the primary driver of the increased number of nonpayers. The budgetary cost of tax credits reached $224 billion in 2010. Though most nonpayers of the income tax are generally low income, the number of nonpayers in middle income categories has grown. The median income of nonpayers has increased by 40% over the last 9 years. The threshold at which a typical married couple with two children will likely be a nonpayer is now $47,000. Recent debates over the equity of the income tax system have centered chiefly on whether high-income Americans are paying their “fair share” in taxes. There has been less discussion about the growing number of Americans who pay no federal income tax—the so-called nonpayers. Today, the percentage of tax filers who pay no income taxes due to the generous credits and deductions in the tax code has reached levels not seen since the income tax became a “mass tax” in 1940. This trend raises serious concerns about the equity of the U.S. tax system, the fiscal stability of the federal government, and the political implications of disconnecting millions of citizens from the primary means of funding government programs. Recent IRS data reveals that in 2010, over 58 million federal income tax filers had no income tax liability after taking deductions and credits. This amounts to nearly 41 percent of the roughly 143 million tax returns filed that year. Indeed, many of these filers actually had a negative income tax burden because they were eligible for “refundable” tax credits even though they had no income tax liability. These taxpayers did this through the wholly legal and legitimate use of deductions and credits provided in the income tax code. These 58 million nonpayers represent the second highest percentage of nonpayers since 1940, behind only 2009, where nearly 42 percent of income tax filers were nonpayers. By contrast, the low point in the modern era for nonpayers was 1969, when only 16 percent of filers had no income tax liability. 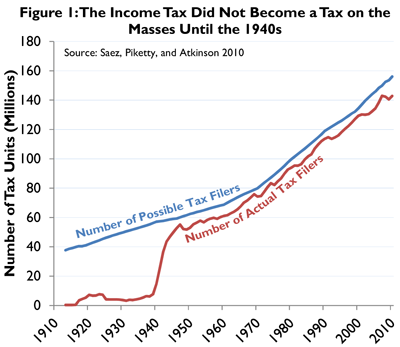 As recently as 2000, 25.2 percent of filers paid no income taxes. A nonpayer is an individual or couple who, after taking advantage of their legal credits and deductions, has zero income tax liability. This is not the same as those who have overpaid their taxes through paycheck withholding and then receive a portion of that withholding back after filing a tax return and receiving a refund. Table 1 demonstrates how a family of four making $45,000 in adjusted gross income can become a nonpayer. After taking a standard deduction of $12,200 and personal exemptions of $14,800 (four times $3,700) the family’s taxable income is reduced to $17,200. This income level puts them in the 10 percent tax bracket, at which they would have a tax liability before credits of $1,720. From this, they are allowed to deduct two tax credits of $1,000 for each of their two children. As the table indicates, these two credits bring their $1,720 liability to zero. However, since the child credits are refundable, the family also receives a check for $280 from the IRS for the remaining value of their two dependent child credits. Some families may also be eligible for other credits such as the child care credit, education credit, or the tax credit for purchasing a hybrid vehicle. What is the Real Number of Nonpayers? There is frequent confusion about the true number of Americans outside the income tax system. The 58 million figure cited here is strictly the number of Americans who file an income tax return but have no income tax liability after credits and deductions. Since the early days of the income tax, the tax code has contained provisions that exempt low-income workers or greatly reduce their tax burden. The standard deduction, personal exemption, dependent exemption, and earned income tax credit are all examples of these types of provisions. Indeed, during the decades following the enactment of the income tax, the filing threshold was set so high that few Americans were even required to file a tax return. Fewer still ended up paying income taxes because of the value of the personal exemption and the deductions allowed for such things as interest, state and local taxes, and business losses. The number of Americans who filed a tax return remained very small all the way up to the start of World War II, during which virtually all Americans were brought into the income tax system (see Figure 1). In the early years of the income tax, the personal exemption for taxable income was very high relative to the majority of incomes in the nation. For example, in 1916, the average employee income was $705 in current dollars, yet the personal exemption was set at $3,000 for single filers and $4,000 for married filers. In today’s dollars, this equates to about $62,000 for a single individual and roughly $82,500 for a married couple. Only about 1.1 percent of working age Americans even filed a tax return and roughly 17 percent of the 437,036 Americans who did file a tax return had no income tax liability. In 1917, the personal exemption dropped to $1000 for single filers and $2,000 for married filers. This increased the number of filers to nearly 3.5 million. At the same time, however, lawmakers enacted a $200 per dependent exemption, which helped increase the percentage of nonpayers to 22 percent. During World War I, the percentage of Americans who were required to file a tax return climbed to as high as 17 percent. 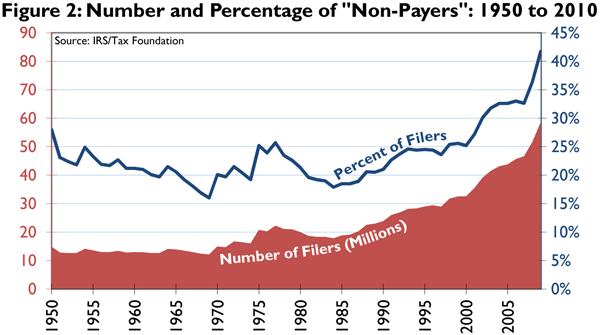 After the war, the percentage of filers fell to below 10 percent and remained at roughly that level through the mid-1930s. During the post-World War I period, the value of the personal exemption was increased, which in turn boosted the percentage of nonpayers to over 56 percent in 1934—even though the top marginal income tax rate hit 63 percent that year. The years leading up to the start of World War II changed the income tax from a tax on the relatively wealthy to a tax on the masses. In 1939, the personal exemption stood at $1,000 for single filers (equal to the income level required to file a tax return) and $2,500 for married filers. In today’s dollars, this equates to roughly $16,200 for singles and nearly $40,500 for married couples. That year, less than 14 percent of working adults filed a tax return. By 1942, the value of the personal exemption dropped to $500 for singles and $1,000 for married couples. As a result, the number of tax returns jumped from 7.7 million in 1939 to 36.7 million in 1942. In 1945, the number of tax filers approached 50 million while the percentage of Americans who filed an income tax return neared 85 percent. By contrast, the percentage of nonpayers fell to 10 percent in 1945 (see Table 3 at the end of this Special Report for each year’s data). Since the end of World War II, the percentage of working Americans who file a return has remained very high—typically between 85 percent and 95 percent—but the percentage of nonpayers has fluctuated wildly over the decades (see Figure 2). In the modern era, the percentage of nonpayers began to climb significantly after the Tax Reform Act of 1986, which increased the value of the standard deduction and nearly doubled the size of the personal exemption. Indeed, between 1986 and 1989, the personal exemption for singles grew from $1,080 to $2,000, and for married couples it grew from $2,160 to $4,000. As a result, the percentage of filers who became nonpayers jumped from 18.5 percent to 20.5 percent. In the 25 years since then, the percentage of nonpayers has doubled thanks to the expansion of the Earned Income Tax Credit (EITC) and the enactment of a plethora of new credits, such as the child credit and the more recent Making Work Pay Credit. With respect to the EITC, the Omnibus Budget Reconciliation Act of 1993 increased number of taxpayers qualifying for the EITC as well as the value of the credit. By 1995, the percentage of nonpayers reached 24.5 percent, nearly 29 million tax filers. This growth accelerated following the enactment of the Taxpayer Relief Act of 1997, which created a $500 per child tax credit for families earning less than $110,000. By 2000, the number of nonpayers topped 32.5 million, or 25.2 percent of all filers. The child credit was then expanded by the Economic Growth and Tax Relief Reconciliation Act of 2001 which increased the child credit at a graduated rate from $600 in 2001 to $1,000 in 2010. The Jobs and Growth Tax Relief Reconciliation Act of 2003 then more rapidly increased this amount to $1,000 for 2003 and 2004. The $1,000 credit was further extended from 2005 through 2010 by the Working Families Tax Relief Act. The EITC was also subsequently expanded multiple times throughout the late 1990s and 2000s. These changes boosted the number of nonpayers dramatically during that period. Between 2000 and 2006, the number of nonpayers grew by 13 million, or 40 percent, from 32.5 million to 45.6 million. In 2006, more than one-third of all Americans who filed a tax return paid no income taxes after benefiting from their credits and deductions. More recently, the new tax credits introduced in 2008 and 2009 by both the Bush and Obama administrations in response to the recession have accelerated the growth in nonpayers. These include the Making-Work Pay credit, the American Opportunity tax credit for education expenses, the first time homebuyer credit, and the alternative motor vehicle credit. These new credits boosted the number of nonpayers by another 28 percent, nearly 13 million, between 2006 and 2010–thus increasing the percentage of nonpayers from one in three tax filers to more than two in five. As the number of nonpayers has grown, so too has the number of tax filers who receive cash payments because of the expansion of refundable credits. The combined budgetary cost of basic tax credits (non-refundable credits that offset only a filer’s income tax liability) and refundable tax credits (the cash payments) has soared over the past few years. 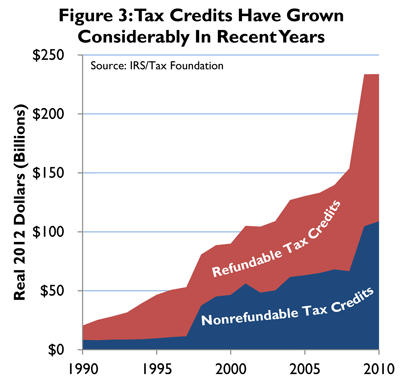 Figure 3 details the growing cost of both types of tax credits over the past two decades. In 1990, the combined value of these credits was roughly $20 billion after adjusting for inflation. In today’s dollars, the budgetary cost of basic tax credits was around $8 billion, while the refundable credits under the EITC totaled $12 billion. By 2000, basic tax credits had a budgetary cost of $46.5 billion, in 2012 dollars. The child credit was by far the biggest portion of this at more than $25 billion after adjusting for inflation. Some 26 million taxpayers took advantage of the child credit that year. Refundable credits amounted to $43.4 billion in 2000, nearly all of which was attributed to the EITC. A decade later, the combined budgetary cost of both the basic and refundable tax credits reached a remarkable $224 billion in 2010. This was larger than the budgetary cost of the tax exclusion for employer-provided health insurance that year, the largest tax expenditure in the federal budget. As of 2010, refundable cash payments to nonpayers comprised over half ($120 billion) of the total cost of tax credits. The largest refundable credits in 2010 were the EITC ($59 billion), the child credit ($27.5 billion), and the Making Work Pay credit ($16 billion). The budgetary cost of basic tax credits in 2010 was $104 billion. Roughly two-thirds of these total costs were comprised of the Making Work Pay credit and the Child Credit. Another 24 percent of these costs were attributable to the foreign tax credit and the education credit. In addition to the introduction of new tax credits, the post-2007 increase in nonpayers could also be caused in part by labor market effects of the recession. It is possible that some workers were made eligible for the Making Work Pay credit, for example, because they lost their jobs midyear, accepted lower wages at their current job, or settled for a lower paying job after losing their job as a result of the recession. However, it is difficult to parse out the magnitudes of causes for the growth in nonpayers between the recession and the new credits. These credits have a larger impact than their pure monetary cost. Some 73 percent of those claiming the EITC had to use a tax preparer according to the 2010 annual report of the IRS’s National Taxpayer Advocate. That rate is 62 percent for all taxpayers. The high rate at which taxpayers must seek the assistance of a tax preparer is indicative of the complexity of the tax code and the extent to which that complexity creates a substantial compliance cost. That same report by the National Taxpayer Advocate found that complexity is a contributing factor to the estimated $10 billion to $12 billion in erroneous overpayments made to those claiming the credit in 2006. Those overpayments represent almost a quarter of the total $44 billion in EITC claims that year. Moreover, these costs do not begin to estimate potential economic distortion and deadweight loss, resulting in credits that incentivize certain types of social and economic behavior. Though most nonpayers are low income by conventional standards, the income level at which one can become a nonpayer has crept upward over the last decade. Table 2 details the percentage of tax filers with no income tax burden by income group. Income brackets for this table are not adjusted for inflation. For example, in 2001, only 60 percent of tax filers making between $7,000 and $9,000 of income were nonpayers. By 2005, the share of nonpayers in this income group had grown to 74 percent, and by 2009 had jumped again to 84 percent. Similarly, for those making between $25,000 and $30,000 a year, the share of nonpayers was 18 percent in 2001 but then increased to 33 percent by 2005 and 47 percent by 2009. Even for those in middle to upper-middle income categories, the share of nonpayers has substantially increased. For those making between $50,000 and $75,000, only 1 percent were nonpayers in 2001. By 2005, that figure was almost 5 percent, and by 2009 had hit 12 percent. For those making between $75,000 and $100,000 the share was 0.3 percent in 2001, a little over 1 percent in 2005, and over 4 percent by 2009. In 2001, the share of nonpayers making over $50,000 (inflation adjusted to 2009 dollars) is roughly only 1 percent of tax filers or 2 percent of total nonpayers. By 2009, the share of nonpayers making over $50,000 was 3.8 percent of tax filers and 4.5 percent of total nonpayers. The threshold at which the typical married couple with two children will likely be a nonpayer given the standard deduction, personal exemption, and only two dependent child credits is now roughly $47,000. Although many low-income nonpayers do pay other federal taxes such as payroll and excise taxes, the value of refundable credits is getting so large as to offset these other tax costs. 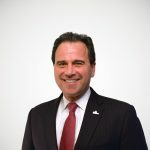 For example, the Joint Committee on taxation estimated that in 2009, the value of refundable credits exceeded the employee share of payroll taxes for 23 million tax filers and exceeded the employer's share of payroll taxes for 15.5 million filers. What this means is that these Americans are not just being absolved from contributing to the basic cost of government, but they are also avoiding contributing to the cost of their own retirement as well. Since the first income tax code was enacted in 1913, the tax system has protected certain classes of Americans from paying the income tax. Starting in about 1940, however, the federal income tax changed from being a tax largely on high-income workers, to a mass tax on virtually all working Americans. But thanks to the rampant growth in tax credits over the past two decades or so, the federal income tax is reverting to its original composition – a tax largely on high-income Americans. 2009 and 2010 saw a record number of tax filers pay no income taxes because of the generous credits and deductions in the code. More than one out of every four tax filers no longer contributes to the basic cost of government because of these credits and deductions. In addition, millions of these nonpayers also received cash back through refundable credits, such as the EITC, child credit, and Making Work Pay credit. These credits not only have a major budgetary cost – both in terms of the lost revenue and the outlay cost for the refundable portion – they undermine the financial stability of the government by narrowing the tax base and disconnect people from the basic cost of government. The latter consequence is what Noble Laureate James Buchanan calls “fiscal illusion.” When people perceive government to be cheaper than it really is, they will demand ever more of it because they either don’t have a true sense of its cost or they assume that others will bear the cost. As lawmakers debate the equity of the current tax system, the conversation cannot be solely about the tax burden borne by the rich. It must include an honest discussion about how many Americans should we allow to be nonpayers and, thus, held harmless from the basic cost of government. Note: 2010 numbers are based on preliminary data represent estimates of income and tax items based on a sample of individual income tax returns filed between January and late September of a given processing year. These returns are then weighted to represent a full year of taxpayer reporting. In general, some of the returns processed during the remainder of the year may have somewhat different characteristics compared to these earlier ones. Therefore, these preliminary data are best utilized by comparisons made to the preliminary estimates from the prior year. When available, the estimates from the Complete Year Data should be used in place of the primary data. Errata: An earlier version of this report used a sample tax calculation that was mislabeled as using 2011 tax law when it actually used Tax Foundation projections for 2013. The calculation has changed to reflect 2011 parameters. Hypothetical tax return generated using Tax Foundation’s MyTaxBurden tax policy calculator. This hypothetical return can be viewed or modified at: http://goo.gl/Oj8bB . Internal Revenue Service, Tax Year 2008 Preliminary Data: Selected Income and Tax Items by Size of Adjusted Gross Income, Table 1: Individual Income Tax Returns. See Tax Policy Center, Baseline Distribution of Tax Units with No Tax Liability, Current Law, 2004-2011, Table T11-0173 (June 14, 2011), http://www.taxpolicycenter.org/numbers/displayatab.cfm?Docid=3054&DocTypeID=7. See also Memorandum from the Joint Committee on Taxation, Information on Income Tax Liability for Tax Year 2009 (Apr. 29, 2011), http://finance.senate.gov/newsroom/ranking/download/?id=9fe27e9f-a5e0-4010-8461-ffc00b5c00ef. U.S. Census Bureau, Historical Statistics of the United States: Colonial Times to 1970, Average Annual Earnings of Employees: 1900 to 1970. Tax Foundation, Federal Individual Income Tax: Exemptions and Treatment of Dividends, 1913-2006 (Dec. 12, 2006), https://taxfoundation.org/article/federal-individual-income-tax-exemptions-and-treatment-dividends-1913-2006. Thomas Piketty & Emmanuel Saez, Income Inequality in the United States, 1913-2002 (Nov. 2004), Table A0, http://emlab.berkeley.edu/users/saez/piketty-saezOUP04US.pdf. The estimate is based on the percentage of “tax units” who filed. Tax units are roughly the number of working age, single and married, adults who could be considered the universe of possible taxpayers. The EITC was originally enacted in 1975 by the Tax Reduction Act of 1975. The child credit was phased out over a $20,000 income band—$50 for every $1,000 of income over $110,000. As a result, a family of four could get some portion of the credit up to $150,000. Internal Revenue Service, Statistics of Income, Table A. Selected Income and Tax Items for Tax Years, 1990-2009, in Current and Constant 1990 Dollars, http://www.irs.gov/pub/irs-soi/09intba.xls. National Taxpayer Advocate, Report to Congress: Fiscal 2010 Objectives, June 30, 2009, http://www.irs.gov/pub/irs-utl/fy2010_objectivesreport.pdf. The IRS has not published a time series of nonpayers by income level that is inflation adjusted, making Table 2 the best data available. This makes comparing year-over-year changes imprecise, but the growth of nonpayers at higher income levels is still demonstrated by the table. Hypothetical tax return generated using Tax Foundation’s MyTaxBurden tax policy calculator. This hypothetical return can be viewed or modified at: http://goo.gl/YvGRj. James M. Buchanan, Public Finance in Democratic Process: Fiscal Institutions and Individual Choice, http://www.econlib.org/library/Buchanan/buchCv4c10.html.